You want to toss away the necessity of silverware and really take ahold of your food? We understand. The beauty of a burrito is the simplicity of a meal wrapped up in the doughy blanket of a tortilla and placed straight into your hands. From flavorful veggies to sauces packed with heat, there is no restricting what can be tucked inside. The bistro bustles with friendly employees who serve you moments after ordering. Their burritos spill open with spiced potatoes or bright yellow squash, and the tortilla is pinned together with toothpicks, holding in the fresh-tasting contents. The most budget-friendly item on the menu is the Veggie Burrito ($3.99), an option that tastes both healthy and indulgent with zucchini, egg whites, and soy cheese. 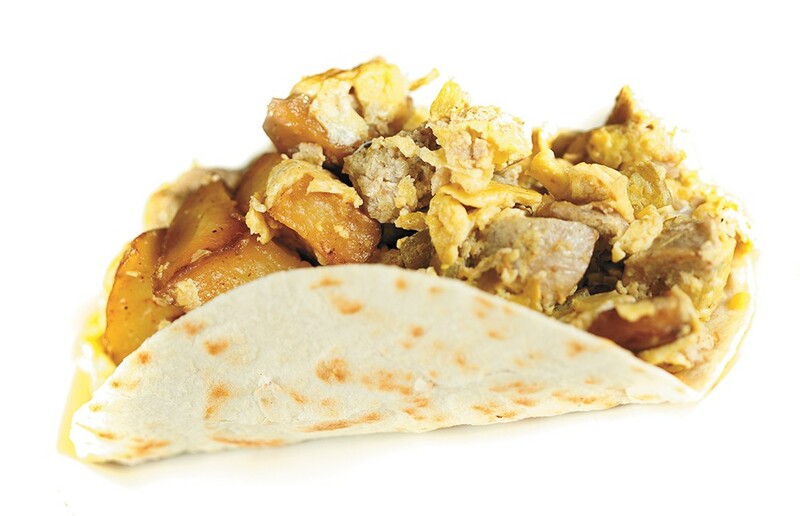 The Chicken Apple Sausage Burrito ($4.99) is spiced with green chile and Huckleberry's own specialty sausage. Don't let the convenience of the drive-through or the brightness of their red-and-yellow menu trick you into thinking their food is any less delicious. Plenty filling for one, the Giant Chicken Burrito ($4.80) includes rice, guacamole, pico-style Mexican salsa, lettuce and cheese. The Atilano's Special Giant Burrito ($4.80) is packed with thick bacon, steak, potatoes, sour cream and cheese. Atilano's burritos are tightly wrapped, making sure your stomach, rather than the paper plate, ends up enjoying every bite. The family-oriented atmosphere and huge menu at family-owned Dos Amigos provide plenty of options for any fan of Mexican cuisine. Served with generous helpings of beans and rice on the side, their Burro Fajitas Burritos ($6.25) can be ordered with either chicken or beef, while the the Veggie Burrito ($5.50) and De Beans & Cheese Burrito ($4.50) are vegetarian-friendly. Gerardo's Authentic Mexican is a family-owned, family-run business on North Monroe. The authenticity asserted by the restaurant's title is proven in the dishes they offer; the flavor and portion size of each menu item is reminiscent of a restaurant in Mexico. Beyond their 25 combination plates, a hungry customer can choose from the variety of huge burritos — Carne Asada ($4.60), Fajita ($5.50), and a simple Bean and Cheese ($3.15) all included. There are also six different breakfast burritos on the menu ($4.15-$5) for morning visitors, as restaurant hours extend from 8 am to 2 am. Neato Burrito is in no way interested in sticking to the norm. Their menu offers burrito options that you would never have imagined, from Vegan Curry to BBQ. Neato allows the customer to choose a tortilla from a variety including Spinach and Cilantro, and then build upon that with a buffet of rice, meat, tofu, and veggies. The Veggie Thai, one of their specialty burritos, is a customer favorite, with rice, black beans, peanut sauce and cabbage. All burritos are $6 for a small and $7.25 for a large, and an additional $1 for meat or tofu.